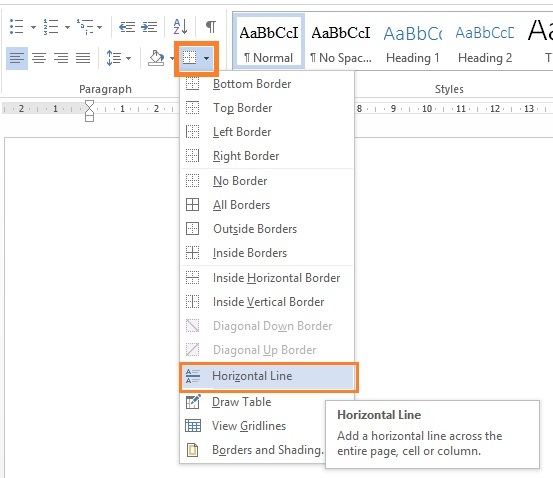 Draw horizontal and vertical line in Microsoft Office Word 2013 – will show you how to insert a line (horizontal or vertical line) in Microsoft Word. You need to insert a horizontal or vertical line inside the word document to separate data. You can insert vertical line or draw horizontal line at any place of the office word 2013 as per wish. The process will show you how to insert a horizontal line in word 2013. Just open your Microsoft office Word document and insert a horizontal line at the required place. 1. Open the Microsoft Office Word document on where you want to add a horizontal line. 2. Choose the place where you want to insert the horizontal line in word document. 3. Navigate to “Home” tab. 4. On the Border section click on the small downward arrow and choose “Horizontal Line” from the drop down menu to draw a horizontal line on that place on the word document. The process will show you how to insert a vertical line in Microsoft Office Word 2013. Just open your Microsoft Office Word document and add a vertical line at the require position. 1. Open the Microsoft Office Word document on where you want to add a vertical line. 2. Navigate to “Insert” tab on the Word 2013. 3. 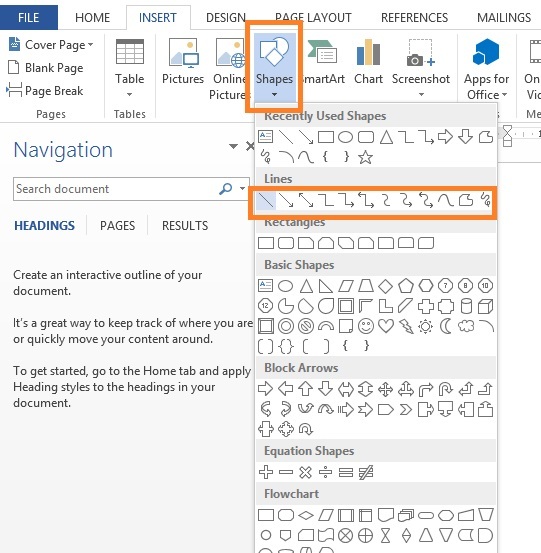 Click on “Shapes” and choose the type of line you want to insert vertically on your word document. 4. After that move your mouse and draw the line in the word document. Then adjust the line vertically. Note: In the step-4 you can also adjust the line vertically or in angle or any other type of line also. Note: The process works well on the Microsoft Office Word 2013. It is better to use the genuine Microsoft office to get all the features. The pirated version may or may not contain all the features. I’ll be regularly in need of new updates softwares.